The US dollar has had a torrid rally. But my charts suggest a correction is due. Maybe that is what this latest bout of currency-market volatility is telling us. Volatility is often a precursor to a change in trend (in all time frames). We know dollar sentiment is overwhelmingly bullish – it seems a one-way bet right now. But Mr. Market is watching because he loves one-way bets. I'm not betting big on a correction right at the moment. But I have told my subscribers to get ready. Today’s price action plus sentiment data suggest a speculative extreme may be near. Sentiment extremes suggest a turning point is imminent. Be careful, all you euro bears! The red circles denote peaks in open interest that corresponded with key lows in the price of the euro. Given the extreme levels, I think euro bears should be very careful. I am monitoring the major pairs closely. Because if a correction lower in the dollar does materialize at these levels, it would likely be at a least multi-day, and probably a multi-week, event -- in other words, something playable. Analysis like this is one way I keep my subscribers prepared. Until recently, it's been up to them to follow along and follow through. Now, however, they don't even need to! They can check out for a day ... a week ... or a month at a time and not have to worry about missing profit opportunities. That's because I'm launching a new auto-trading opportunity they can use to replicate the trades I recommend and execute in my personal account ... in their own accounts! This is open to new subscribers as well. Read more about it at this link. Thank you. And be careful out there. Yes. I would argue there is a litany of reasons. In fact, we're preparing this long list of reasons for members of our Global Investor trading newsletter. And it will be published later today. If you're interested in staying plugged in to what's driving markets, and if you're interested in explicit ETF trading ideas, then I suggest you snag yourself an early Christmas present. The trend described above is going on five years running. And as I said, the lifecycle of a trend doesn't always breakdown into five tidy stages. So let's zoom in a bit for confirmation that the technical setup may be turning bearish for US equity averages. 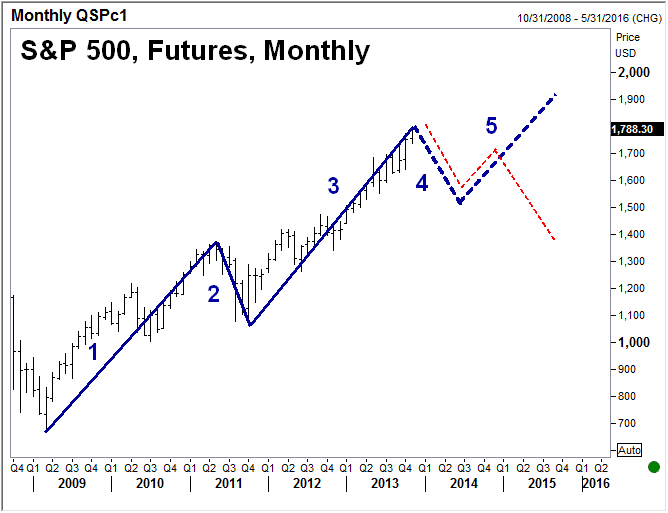 A review of Elliott Wave Principle by Frost & Prechter reminded me of diagonals, particularly ending expanding diagonals. That's what I've drawn in on the chart above. 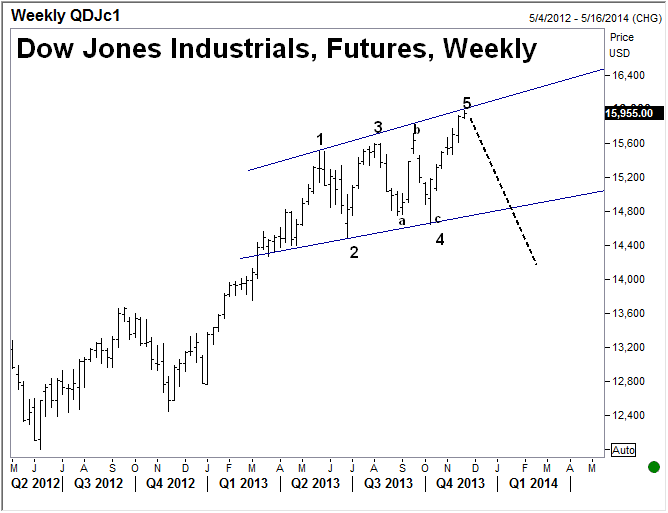 It suggests the Dow has exhausted its upside and is due for a significant retracement. Black Swan Forex service has averaged about 196 pips per month. … Based on trading one lot per recommendation; imagine if you traded more than one lot. Subscribe here. What a weak-handed attempted to recover $7.7 billion in redemptions last month. That's the amount of money that flowed out of Pimco's $41 billion Total Return Fund in August. And Bill Gross is trying to stem the outflows by promoting the NEED to be in short-term Treasuries and credit. He and his colleague, Mohamed El-Erian, are campaigning with their predictions for a very unstable investing future, albeit one where the Fed continues to maintain historically low interest rates. As it concerns the more immediate future -- the taper -- I think the Fed will at most gesture with a small decrease in its monthly bond purchases. But it will need to simultaneously emphasize its continued commitment to low interest rates, monetary accommodation and new bond purchases if needed. The Fed is nowhere near an exit if you consider the global dependency its policies have created. The global economy is not ready to stand without the Fed's crutch. Well, sticking with Bill Gross's area of expertise, I think bonds may find some support here. A colleague of mine this week called shorting bonds "the easiest trade in the world right now." As such, he seemed as reluctant as I am to jump on this easy trade right now. On a weekly basis, this drop in bond prices (rise in interest rates) appears to be overextended. In looking at a weekly chart I noticed a similar price pattern between now and late 2010/early 2011. In the last four months, the 30-year Treasury Bond has fallen nearly 13%. In the four months ending January 2011, the 30-year Treasury Bond fell just over 13%. What happened after January 2011? It's interesting you ask. The 30-Year Treasury Bond price rallied 40%, low to high, over the following 17 months. Now, I know this is not a perfect and certainly not a scientific comparison. So many things are different different between now and then. So this pattern may not be an apples-to-apples comparison. And it may not be a trading signal you're comfortable jumping on. But it may be worth considering nonetheless. It may show we're close to a maximum tolerance level for interest rate increases over said period of time. The US Nonfarm Payrolls report this morning was not stellar. It wasn't overtly bad either. But it was soft enough that it gets investors thinking more about the anticipated certainty of the Fed taper. Minneapolis Federal Reserve Bank President Narayana Kocherlakota recently said the US economy needs more stimulus, continued QE. He says the Fed’s own forecast on inflation and unemployment calls for continued accommodation. If the Fed does decide to taper, this suggests it will be a marginal move -- a gesture -- that keeps its ultimate commitment to accomodation intact. Interest rates may find at least a temporary top if this idea gains traction. It seems the US trade deficit data released yesterday went largely unnoticed. And that's usually how it goes each month, probably because there tends not to be much, if any, knee-jerk market reaction to that report. To recap: the US trade deficit widened sharply in August. That followed the previous month's narrowing to a level not seen since October 2009. I was particularly wondering how this might impact the US dollar. There is not a tight correlation between the US trade balance and the US dollar, especially over the shorter-term. But the widening trade deficit is a nod to the typical dynamic -- trade imbalances -- that's characterized global growth over the last decade. Manufacturing PMIs in US, Europe and China are all higher in the most recent month, poking above the 50-level that delineates expansion and contraction. Despite the recent scare over emerging markets, many are quick to notice a general stabilization in global growth expectations.The US economy has been the least of the concern for investors. But if the world is seen to be stepping back into what's been a typical growth pattern, then maybe Asia (namely China) gets cut some slack. In an environment where things seem to be "back to normal," then maybe we see capital exit the US in search of return. Maybe the US dollar loses any safe-haven appeal and is potentially looked at as a funding currency. And maybe most markets around the world feel a reprieve from recent selling pressure. Obviously this is all speculation on my part. And it's all speculation that I imagine would run its course in a relatively short period of time, say three to six weeks. So I may be stretching it to think the trade deficit could have such an influence on markets in that amount of time. But one reason (among many) I tend to think such a "back to normal" growth mentality won't last too long: the recent US GDP beat was driven largely by a surge in exports. As mentioned, the latest trade deficit number showed the surge in US exports reversed last month. In other words: come the end of September or early October, everyone may be rethinking their expectations for the US economy. And if they start rethinking the US, chances are they'll start rethinking global growth as well. This chart is from Part 5 of a five-part series The Wall Street Journal put together on "China's Rising Risks." Click the image to access the article. 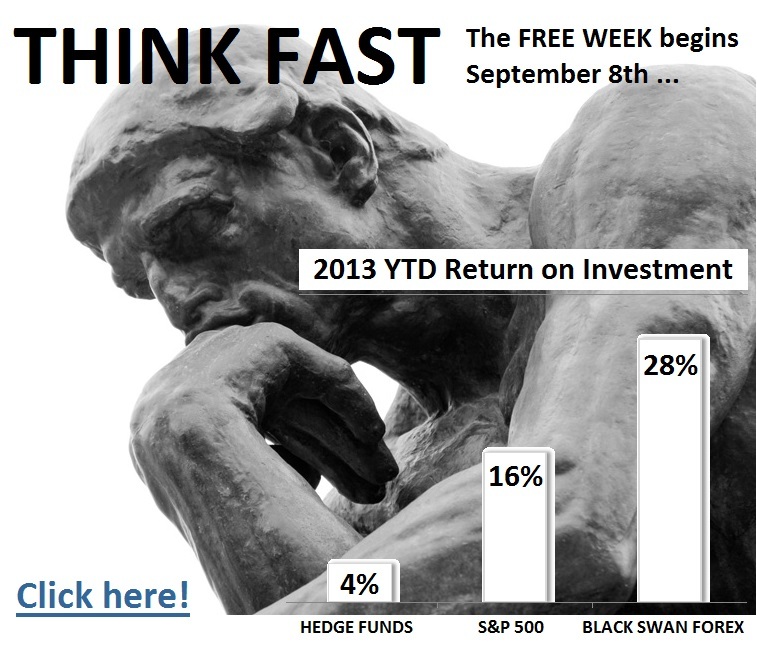 September is well known for being the worst month for US equity market performance. That may be reason enough to expect the opposite in the early going. After all, the catalysts for market weakness -- mainly concern for emerging markets and rising interest rates -- are probably overdone in the near-term. I expect a reprieve from general selling pressure in global equity markets and other risk assets over the next few weeks. In that environment, the US dollar probably will be pressured lower. Once the US dollar is again looked at as a dog, it should be about time for it to head higher as many have been quick to forecast in recent months. Take what you want from that headline! We could soon witness a sharp and steep, though perhaps short-lived, rally in Treasury prices. To be sure, I began to think we were due for a rally in Treasury prices back in June. That's when prices had already taken a big hit and there was a palpable risk-off mood in other asset classes. I thought Treasuries might get a a safe-haven boost in such an environment. Apparently there were plenty of others who thought the same thing. Because the negative mood came and went with barely a hiccup in Treasury prices' downtrend. In fact, anyone who positioned for a rally in Treasury prices were devoured by the bears on a renewed surge lower. And that leaves us where we are today. The downside has become quite extended. And it appears the trade is becoming a bit lopsided as the fundamentals are shaping up in such a way to confirm the suspicions driving Treasury prices lower. But we know the market. And most of us probably respect the buy-the-rumor-sell-the-news dynamic. In this case, however, it'll be a sell-the-rumor-buy-the-news dynamic if Treasuries do rally. Is this explosion to the upside going to happen today? Maybe. Tomorrow? Maybe. This week? Perhaps. But needless to say, even if we are in a long-term downtrend for Treasuries (uptrend for yields), it appears a corrective rally is due to commence very soon.